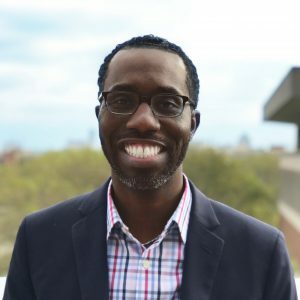 Joseph L. Tucker Edmonds is an Assistant Professor of Religious Studies and Africana Studies at Indiana University’s School of Liberal Arts (IUPUI) and a Research Fellow for the Center for the Study of Religion and American Culture. He earned his Bachelor of Arts in Religious Studies and Economics from Brown University, his Master of Divinity from Union Theological Seminary in New York City, and his PhD in Religious Studies from Duke University. Tucker Edmonds’ research interests are black and womanist theologies, alternative Christianities in the black Atlantic, the role of scripture in African and African American religious traditions, and the relationship between Africana religious identity, citizenship, and globalization. Joseph has received grants from the Wabash Center for Teaching and Learning, the Fund for Theological Education, and the Woodrow Wilson Foundation. His most recent scholarship has focused on the relationship between black theology and African American religious communities with an upcoming article entitled “Diasporic Dances: Theological Musings Betwixt and Between Blackness, Gender, and Sexuality” in the International Journal of Black Theology. In addition to his focus on African and African American Christian traditions, Joseph is a noted teacher and an engaged scholar. Joseph has facilitated workshops and community conversations for the Greater Indianapolis Branch of the NAACP, the Indianapolis Public Schools, and the National Council for Educating Black Children. In 2016, Joseph was awarded the IUPUI Trustees’ Teaching Award for excellence in classroom teaching. Currently, Joseph is working on his first book that will explore radical religious traditions within mainstream African American Christianity. This project highlights the variety and vibrancy of the African American Christian sphere during the latter half of the twentieth century, and it adds to the growing body of work that is addressing alternative Christian traditions, the reorganization of the black public sphere during the twentieth century, and the importance of alternative Christian traditions in shaping the terms of freedom and citizenship in the larger African American community.